Catherine Gilbert Murdock graduated from Bryn Mawr College in 1988 and went on to earn a doctorate from Penn. Her first novel, Dairy Queen (Houghton Mifflin, 2006), won the Borders Original Voices Award, the Midwest Booksellers Award, the Great Lakes Booksellers Award, numerous Readers' Choice awards, and is currently in production for a television series. Her other books include The Off Season (Houghton Mifflin, 2007) and Princess Ben (Houghton Mifflin, 2008). Um, I didn't really set out to write for "young readers," really, but for myself. I came up with the idea of a girl playing football and couldn't stop until I'd written the book, because I was dying to read it. But I've always adored YA fiction, and so I think on some level I was simply writing to my passion. Also, I have the mentality of a 13-year-old, so that part wasn't hard at all. I didn't write Dairy Queen for publication, really--I'd been a screenwriter for almost a decade when I first set out and so was intimately familiar with rejection and quite accepting of it. The book was more of an intellectual exercise, a practice novel so I'd have a better sense of what to do when I actually wrote one. Then my sister, who's a published author, read it and said, "You need to submit this." She recommended an agent, who read it and agreed to represent me, but the book needed tweaking. So I tweaked it for her, because again, I'd spent a decade interminably revising screenplays and was very comfortable with that process. Then she called to say she'd sold it, and I thought, "Well, isn't that nice." Without ever realizing, at any point in this process, that what I'd just done was rare and extremely difficult. It's not even a Cinderella story because Cinderella, you know, suffers a lot before she wins the prince. I didn't suffer, or at least I didn't view it as suffering. I enjoy revising. It's only now, looking back, that it's slowly dawned on me that most writers, well, suffer. Now I feel really dumb. Looking back on your writing apprenticeship, what helped you most in terms of developing your craft? Screenwriting, screenwriting, screenwriting. If you want to write fiction, don't write short stories: write screenplays. Because the structure is so precise, and the demands so rigorous, that you can't fudge anything. You have to learn to create great dialog and sympathetic characters, and rising drama and a gripping conclusion because, well, that's what a screenplay is. And then you move from that experience to fiction, and everyone thinks you're a genius because you can write tight dialog. Tight dialog doesn't require genius, but it does require discipline. Screenwriting's where you get that discipline. 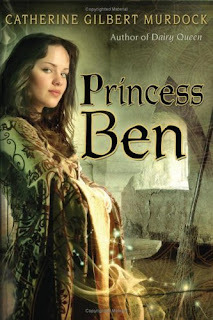 Congratulations on the success of Princess Ben (Houghton Mifflin, 2008)! What first inspired you to write this story? I had a dream about a girl jumping out the window with a broom. It was so dramatic, one of those dreams where you wake up gasping. And it just glommed onto my consciousness, so much that I had to keep going with it or I would have...well, I would have had to write the sequel to Dairy Queen, which was overdue and very stressful. So instead I pounded the first draft of Princess Ben in something like 16 days. See above for the first spark. Then I sent it to my agent and editor, who both said, tactfully, "Fantasy is kind of oversold right now." I hadn't thought of Princess Ben as fantasy--the term hadn't even entered my consciousness until my agent uttered the word. I thought of it as a fairy tale. But I responded with something like, "pooh pooh," though now I know that fantasy is, well, pretty thick on the ground these days. Plus, neither of them thought the manuscript was that stellar, which at that point it wasn't. So I ground my way through The Off Season, and then went back and gutted the manuscript. Then gutted it again. That broomstick dream occurred in November 2005, and the book was released Spring 2008, so the process took a while. Not much research! I love that about fantasy. I'd written my dissertation on drinking customs in late 19th and early 20th century America, so I had this wealth of slowly rusting facts related to dining etiquette and food preparation--can't tell you what a blast it was to weave all that data in. I did need a spot of research on military-dress terminology and forms of address for royalty and nobility; not that anyone will ever notice, but Princess Ben very precise about that sort of thing. And since I imagined the kingdom of Montagne as a sort of southern European bastion, I needed to make sure that all the foods were Old World--I had a bit of panic, for example, about nectarines. But they're as old as apples, whew. It drives me absolutely bonkers when authors get that sort of detail wrong. I read a kids' book last year that on the first page described a heifer who'd lost a calf. Well, a heifer by definition is a cow who hasn't calved yet. You have a calf, you're not a heifer. Period. Don't use words you can't even define. Back to Princess Ben...psychologically, the story began with Queen Sophia as a classic fairy tale villainess, but the more I wrote, the more I kept returning to her--what made her tick? Plus I'd also done a fair amount of work on architectural history in my day, so tying that in and relating it to her, was just a joy. Now she's my favorite character. Logistically I've found that, unless I'm under painful deadline, I simply cannot write if my children are in the house. Don't even speak to me about snow days. Alone, though, I just sit there and churn away until something good comes out. Or I play solitaire. Badly! I did a lot of touring last fall, most of it with a hellacious head cold, and that was the tipping point. Don't know how much more touring I'll manage going forward. I love meeting students, and I'll confess I love staying all by myself in nicer hotels (i.e., the windows need to open), but it's the traveling that takes it out of me. Also, no more bookstore events. Ever. Unless one is Stephenie Meyer, there is simply not enough turnout. I may have to write a picture book one of these days just to feel that love. My children. I read draft #3 or 4 aloud to them; when they start to squirm, it means the writing's bad, and should probably be deleted. Took me many years to learn, but boy, is this method foolproof. Then a couple drafts later, I send it to my agent, who has an eye like a jeweler. I wouldn't tell her how hard it is, that's for sure! Sometimes ignorance is truly bliss. I don't think I'd tell her anything, really; though I wouldn't mind my 2011 self giving me some tips on how to get through this dry patch. As a reader, so far what is your favorite children's/YA book of 2009 and why? I just read The Graveyard Book by Neil Gaiman (HarperCollins, 2008) last weekend and loved it. This means something, because I'm instinctually suspicious of award winners--I read with a jealous and critical eye. But it was truly wonderful. My 13-year-old son is reading it now, and I can't tell you how sweet it is to discuss it with him. We had a great chat last night about Miss Lupescu versus Lupin in Harry Potter. Cook, garden, procrastinate -- I cleaned out the medicine cabinet on Monday! Oh, it's tidy now. Lots of child schlepping. Some teaching of creative writing, but it's not really my calling. Hard to critique others when I'm too busy criticizing myself. My lips are sealed. But it will not be set in Wisconsin.